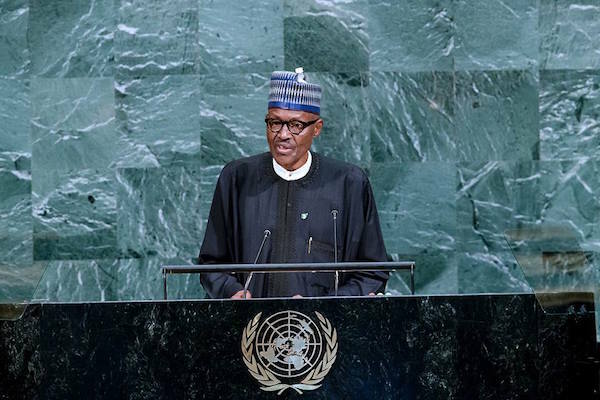 President Muhammadu Buhari has assured the international community of Nigeria’s firm and unshaken commitment to democracy in the country and the African continent. Delivering Nigeria’s national statement during the General Debate of the 72nd Session of United Nations General Assembly (UNGA 72) in New York, Tuesday, the President said this commitment to democratic ideals became profound with Nigeria leading ECOWAS’ effort in the restoration of democratic governance in The Gambia and Cote D’Ivoire. “Our faith in democracy remains firm and unshaken. Our regional organisation ECOWAS came together to uphold democratic principles in The Gambia – as we had done previously in Cote D’Ivoire,” he said. President Buhari called for the sustenance of international collaborative efforts in fighting international terrorism. “We must collectively devise strategies and mobilise the required responses to stop fleeing ISIS fighters from mutating and infiltrating into the Sahel and the Lake Chad Basin, where there are insufficient resources and response capacity is weak,” he said. The Nigerian leader, who described the choice of theme for UNGA 72: Focusing on People: Striving for Peace and Decent Life for All on a Sustainable Planet” as timely and appropriate, drew global attention to issues and crises which impact negatively on the people, the most vulnerable being children and women, and urged concerted international solutions. “The international community cannot remain silent and not condemn the horrendous suffering caused by what, from all indications is a state-backed programme of brutal depopulation of the Rohingya inhabited areas in Myanmar on the bases of ethnicity and religion. We fully endorse the call by the Secretary-General on the Government of Myanmar to order a halt to the ongoing ethnic cleansing and ensure the safe return of the displaced Rohingya to their homes in safety and dignity,” he said. President Buhari also stated Nigeria’s position on the current threat to global peace and security posed by North Korea’s nuclear programme. “All necessary pressure and diplomatic efforts must be brought to bear on North Korea to accept peaceful resolution of the crisis. As Hiroshima and Nagasaki painfully remind us, if we fail, the catastrophic and devastating human loss and environmental degradation cannot be imagined. He also underscored Nigeria’s readiness to cooperate in addressing the growing transnational crimes such as forced labour, modern day slavery, human trafficking and cybercrime. A man exhibiting dictatorship in a democratic setting is talking about democracy in the UN. What a laughing stock?